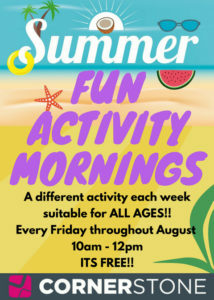 Every Friday throughout August we will be having an activity morning. Each week there will be a differnt activity, suitable for all ages! The activities are FREE and squash will be provided. 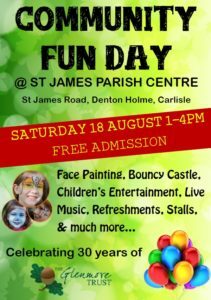 Also on Saturday 18th August St James Chruch, Cornerstone and Glenmore Trust are working together to put on a Community Fun day. This is being held at St James Church and runs from 1pm and finishes at 4pm. There will be loads of free entertainment including DJ, bouncy Castle, free drinks, a quiz, entertainment, face painting, craft and more! Mon-Fri: 9am to 4pm, Saturday: 10am to 1pm, Sunday: Closed. Mon-Fri: 10am to 4pm, Saturday: 10am to 1pm, Sunday: Closed.